This concrete and brick home was in the path of a new subdivision. This structure measured 44’ X 80’ and weighs 240 tons. This home was relocated for John Bass of Clarcona, Florida in July of 2002. These two homes were in the path of a new subdivision. The 2 story concrete and brick structure measures 34’ X 68’ and weighs 188 tons. The one story brick structure measures 32’ X 74’ and weighs 190 tons. 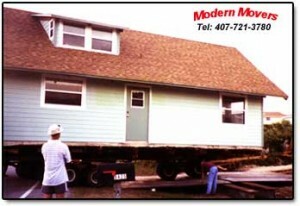 This relocation was for John and Paula Feagins in Seminole County, Florida, in July 2003. This 2 story home was built in the Canaveral Seashore Park in New Smyrna Beach in Florida. In 1970 the Federal Government purchased all the beachfront homes in the Park to restore the dunes to natural. This home was in the path of a new subdivision. The concrete block on slab structure measures 48’ X 66’ and weighs 220 tons. This home was in the path of the new Veterans Parkway. The concrete block with slab floor structure, measuring overall 60’ wide and 66’ long at 220 tons was relocated down the street to a new lot in the same subdivision for Southwest Builders in Fort Meyers in 1999. This home was in the right of way for a state road widening. This home was in the path of the new Veterans Parkway. The concrete block with slab floor structure, measuring overall 45’ wide and 60’ long at 180 tons, was loaded for relocation for Tom Doyle of Flint and Doyle of Fort Meyers, in 1996. This home was in the path of the new Veterans Parkway. The concrete block with slab floor structure, measuring overall 56’ wide and 66’ long at 200 tons, was moved 1 mile to another lot in the same subdivision for Southwest Builders of Fort Meyers, in 1999. These homes were part of the 32 homes we purchased for relocation from Hubbard Construction Company of Winter Park for the construction of the East-West Expressway Eastern Extension in Orlando.